Needing to store items for a short period of time? Storing items during the time home alterations are being conducted can be much more of a hassle than many people would think. Just to store items away for a week would cause the traditional consumer (One who still uses cardboard boxes) hours of hassle and stress. Using cardboard boxes has always been the go to for item storage but after years of innovation the traditional cardboard box has since become obsolete. Taking the place of cardboard boxes is plastic storage crates available from Rental Crates.com. These rent-able plastic totes are the perfect option for customers who need to store their items for a set period of time while their home is being worked on. Plastic Moving Boxes are the Temporary Storage Solution! These crates come pre-assembled and we offer in-home delivery, meaning the team at Rental Crates.com will drop the set amount of crates directly to your home. Once the crates are unloaded and moved into your home they are ready for action, and can be loaded up with all the various items that need to be stored. Once one tote is full simply close the lid and your job is done, you can now move onto the next crate and start the process all over again. Instead of wasting time going to the store and deciding which boxes to purchase, taking the time to assemble each box, and ensuring you have enough boxes for all the items, you could be using that time to actually pack your items. Rental Crates.com also takes the guessing work out of purchasing boxes as we have an intuitive platform through our website that allows users to select how many crates they will need in terms of their home size. Ranging from 1 bedroom to 5 bedrooms, Rental Crates.com and their years of moving experience have calculated how many crates would be needed in order to fit all of your items. Gone are the days of guessing how many cardboard boxes are necessary and either over-buying and wasting money, or under-buying and having to take more time to go purchase more boxes. No matter what type of home improvement is taking place these plastic totes offer the perfect level of protection that cardboard simply cannot compete with. These plastic crates are water resistant and much stronger than cardboard, fitted with a secured interlocking lid that will protect all the items from dust, debris, water, or paint damage. These crates can also be stacked and stored easily and securely so they can be moved and placed wherever need be come time for the work to be done. Once it’s time to unpack all of the items from the crates Rental Crates.com will come and pick up all of the crates from your home. 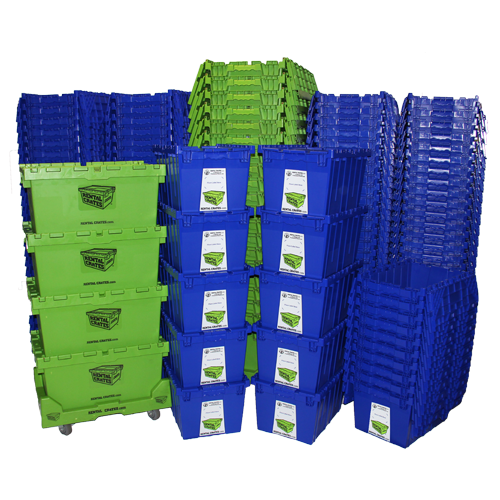 No longer will you need to gather up and waste hundreds of cardboard boxes after one use, as these rental crates are reusable and eco-friendly. In fact these rental crates are made with 100 percent recyclable plastics, so when you chose to rent from Rental Crates.com not only are you combating the issue of cardboard waste, but you are also showing the benefit of using recycled plastics.